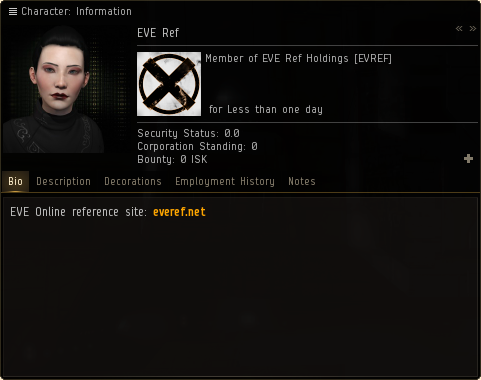 EVE Ref is a reference site for the game EVE Online by CCP. It provides easy access to the information present in the game, such as ships, item stats, industry, reprocessing, systems, agents, etc. The project is still in development. Any feedback is much appreciated. You can reach me on Reddit at /r/EVERef, or on Twitter via @eve_ref or @kennethjor. ISK donations are always welcome. 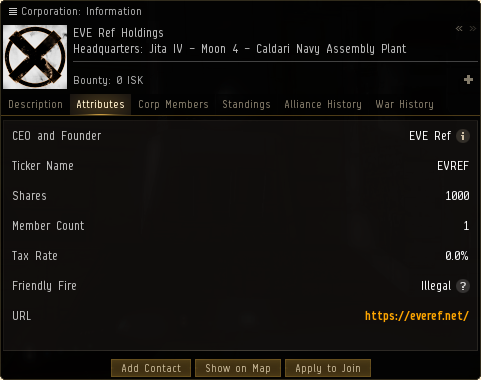 Please send any donations to the character "EVE Ref", a member of the "EVE Ref Holdings" [EVREF] corporation.